To accompany the making of TIONG BAHRU, we asked Singaporeans to make short films about place that mattered to them for WHERE THE HEART IS, a 90 second online film competition. Run in collaboration with DepicT!, a programme strand of the UK’s leading short film festival Encounters, the competition was met with a terrific response. The films moved, surprised and delighted us, and gave us such a quirky, heartfelt and beautiful portrait of Singapore’s landscapes, both physical and emotional. A big thank to all of the filmmakers who took part, and to all those who voted. After long deliberation, The Jury decided unanimously to award THE JURY PRIZE to Isazaly Mohamed Isa’s CORRIDOR. Isazaly was born and raised in Singapore, completed his foundation studies in the arts at LASALLE College of the Arts in 1990 and continued his passion in filmmaking in Kuala Lumpur. He is currently freelancing and provides his editing and motion graphics skills, to both the Singapore and Malaysia television industry. Isazaly’s prize was a 6 day visit to the Encounters Short Film Festival in Bristol, where CORRIDOR played alongside TIONG BAHRU received for its first UK screening. Over the ten days of voting for THE PEOPLE’S CHOICE, more than 5,600 votes were cast, with all films receiving wide support, and being viewed more than 22,000 times in total. Congratulations then to Prashant Somosundram for his film paying tribute to the migrant workers of Singapore, WHEN THE DAY BEGINS, which came in in first place. In addition to the overall winner, two films receiving special praise from the jury: Stephane Lasserre’s meditation on the en-bloc phenomenon, WHERE THE HEART WAS, and Tang Kang Sheng’s rawly emotional REMEMBER. 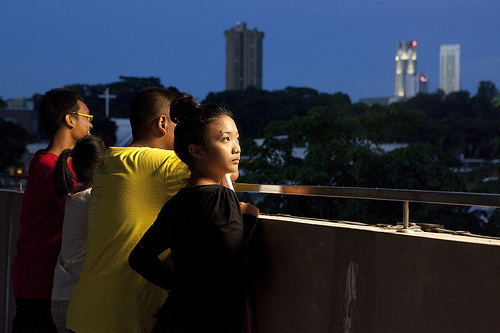 Christine Molloy: ‘WHERE THE HEART WAS‘ is not only a beautiful and evocative film, it is also political, suggestive of the bigger, more contentious issues that define people’s relationship to place in Singapore. Again, of all the submissions covering that kind of terrain it was easily the strongest in our minds. The winning films in both categories and the Special Mention films in The Jury Prize strand played alongside a selection of films from the competition, accompanying the screenings of TIONG BAHRU at the National Museum of Singapore in October 2010. The Top 19 films from the competition were screened at the Sydney Film Festival in June, in a special series of open air screeings in Martin Place, and there will also be openair screenings of the films over 4 days in Perth this October. Visit the WHERE THE HEART IS vimeo channel here.